May 4, 2017 - New Yorker Electronics has rolled out the full series of Electrocube RC Networks Arc-Suppressing Resistor-Capacitor (RC) Circuits. Also known as resistors, resistor-capacitors or RC filters, Electrocube’s RC Networks are designed to prevent or substantially minimize the occurrence of arcing and noise generations in relay and switch contacts. Available in single-phase resistors, single-phase heavy duty RC filters, three-phase resistor-capacitors and three-phase heavy duty RC Networks, they are made from dielectric material to deliver maximum strength to withstand voltage (voltage withstand strength). Arc suppressing resistor-capacitor (RC) Networks consist of specially designed precision capacitors and resistors connected in a series. Spark discharges and induced noise are absorbed over a wide range by the accumulation characteristic and impedance of the capacitor, while the RC time constant delays and averages surge voltage and oscillations. Featuring a wide selection of case configurations with a number of leads, Electrocube RC networks are manufactured both off-the-shelf and made to custom design specifications for single-phase or three-phase applications from one network to 40 networks in a container. Thousands of unique suppression designs eliminate surges produced by relays and solenoids. 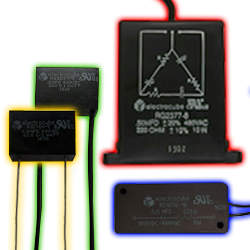 To store surge voltages and current energy and afford protection against inductively induced potentials, RC Networks are made with a high degree of voltage withstand strength, are non-inductive types to ensure a high degree of protection against pulse potentials and are packaged in cases, which meet or exceed the flammability requirements of UL94VO. Electrocube maintains an extensive line of more than 400 precision UL-recognized and ULC-approved RC Networks and specializes in custom designs. New Yorker Electronics supplies the full line of Electrocube products including its full inventory of film capacitors, resistor capacitor (RC) Networks, EMI Filters and high frequency transformers. New Yorker Electronics also makes available Electrocube’s in-house brands such as Seacor supplier (electrolytic capacitor banks and precision capacitors), F-Dyne distributor (film capacitors), with Southern Electronics sales (film capacitors) and pfc Precision Film Capacitors and Standards. 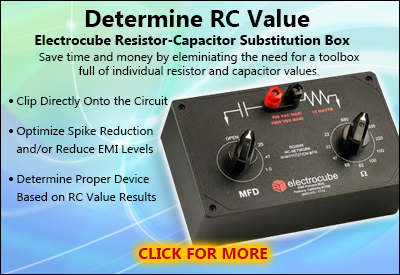 With an Electrocube RC Network Substitution Box, the operator selects and matches various combinations of resistors and capacitors to optimize spike reduction and/or reduce EMI levels. Once the combination is determined, Electrocube RC Networks reference codes provide the proper RC Networks device based on RC value results.